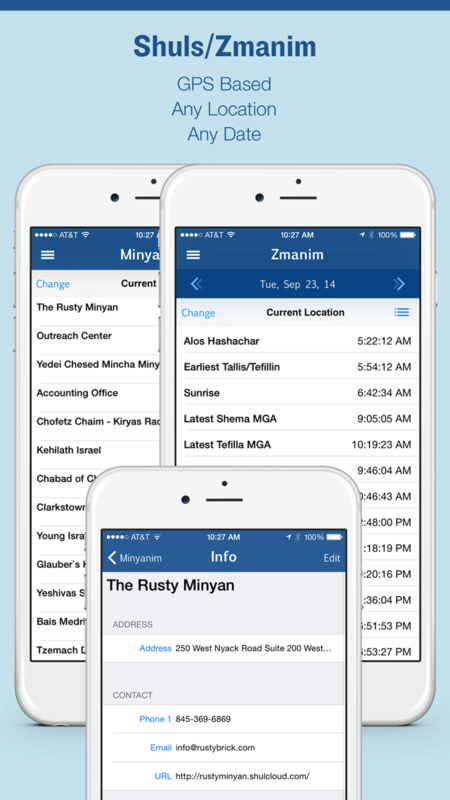 Our Siddur app for iOS was one of the first Jewish apps available for the iPhone. We first introduced it back in July 2008, that was over six years ago. Since then we’ve made hundreds of updates to the app but today, we are introducing our largest update yet. 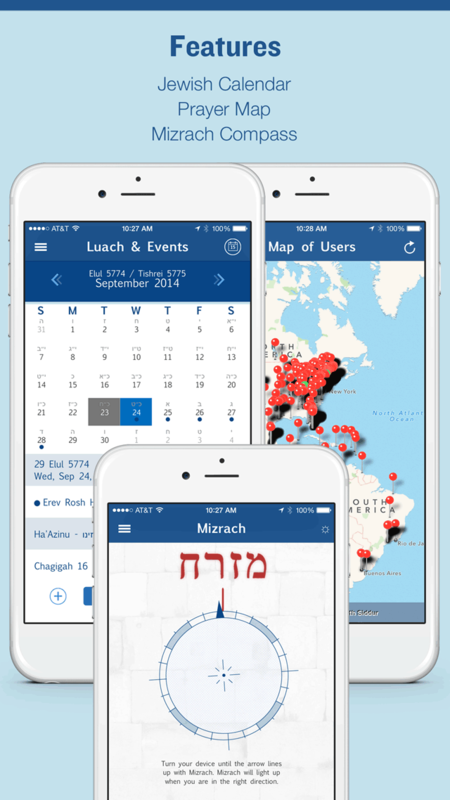 The Siddur is used by thousands of people across the world on both iOS and Android. 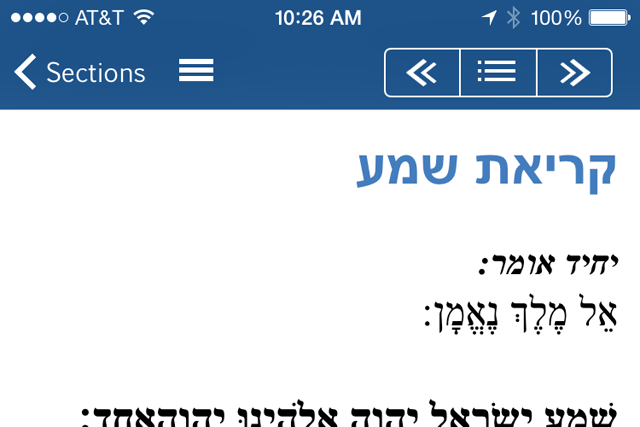 The new iPhone Siddur has been completely redesigned, in fact, it is almost unrecognizable from the original version. It also has been mostly rewritten from the ground up, that means the behind-the-scenes code has been updated. Since so much has changed, we have decided to document below what is new in version 7.0 of the Siddur since version 6.x of the Siddur. 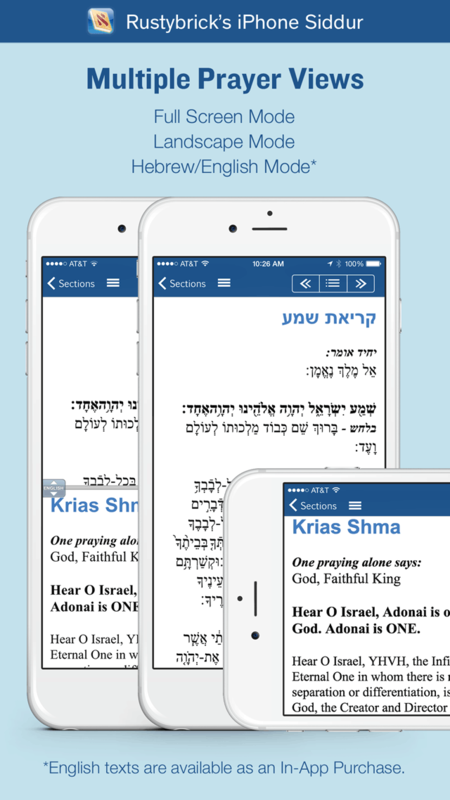 We know, iOS 7 has come and gone and now there is iOS 8 but for the past several months, we have been working on an update to the Siddur design to conform with the iOS 7 design best practices. 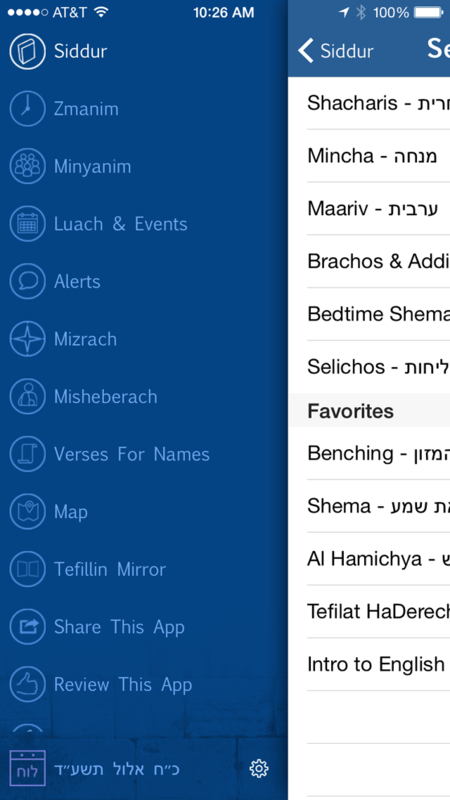 We’ve spent countless hours, meetings, done usability tests and AB testing and have come up with what we think is the best design for the Siddur app. We’ve added as much Siddur text as possible to the screen by removing the bottom navigation bar and enabling a slide out menu from the left. The menu can be accessed by sliding your finger from the left side of the screen to the right or by tapping on the three line menu at the top of the navigation bar. 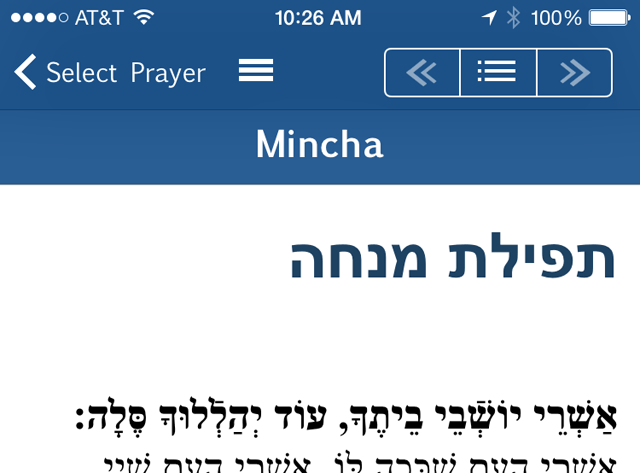 The menu brings you all the features of the Siddur without losing your place while praying. (Note, in settings, you can turn on the old bottom menu by selecting "tab bar mode." Of course, the navigation to the prayer selectors are still there and the scroll wheel to jump between sections remains, but with an updated design. One of the biggest complaints about our Siddur was not about the Siddur but rather about the embedded Jewish Calendar, the Luach. 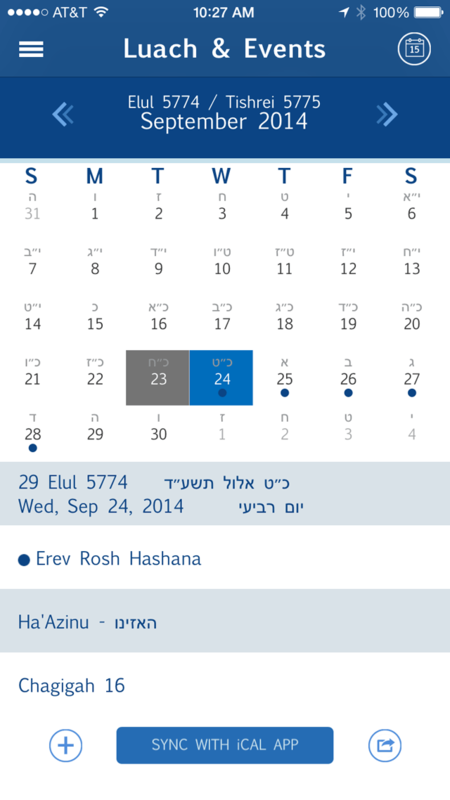 We have completely revamped the design, adding a new month calendar view, with colorized dots to symbolize Jewish holidays, personalized events and more. The list agenda view is still available, as it the jump-to-date feature, but now we have added a new month view. You can still export and sync the data with your calendar as well. The Siddur also added two types of useful widgets, one to the menu bar’s footer within the app and one to the native iOS 8 notification menu. 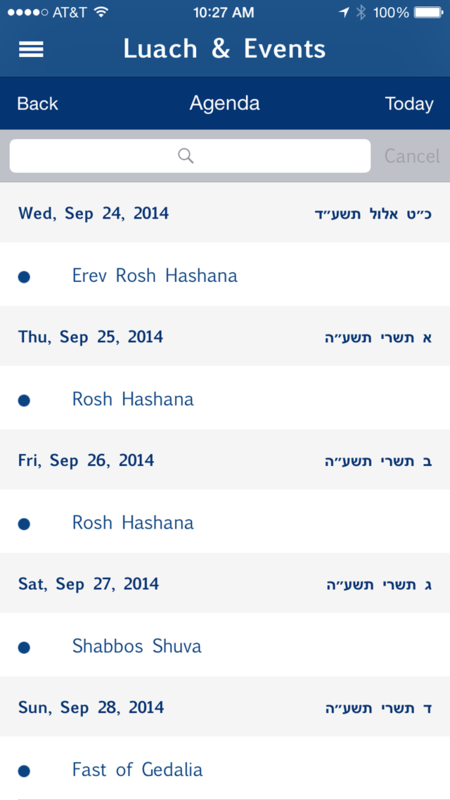 If you look at the footer of the blue navigation bar, you will see a widget that scrolls with data from sunrise, sunset, weekly parsha, the daf and much more. Also, part of iOS 8, we added the ability to add some of this data to your native iOS 8 notification menu. 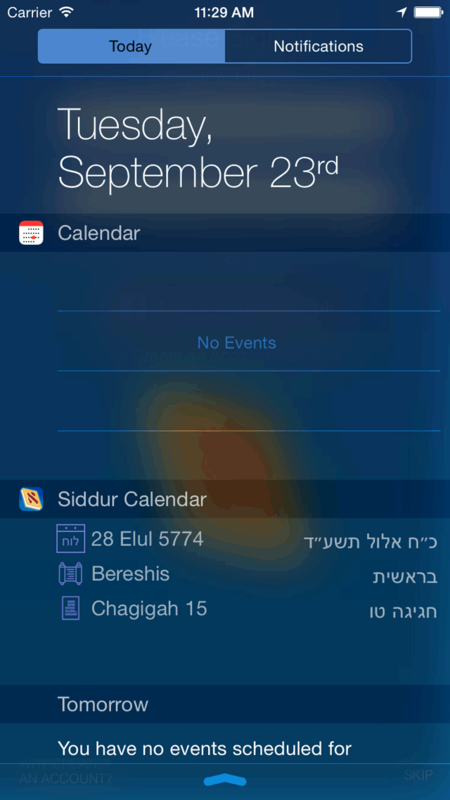 This is known as iOS 8 Extensibility Notification Center and it shows under the Siddur Calendar menu including the Hebrew date, Parsha of the Week and The Daf Yomi. We have also added support for the iPhone 6 and iPhone 6 Plus screen sizes in version 7.01, coming out soon. Without that version, things seem a bit stretched on those devices. We added 64-bit compatibility, along with stability improvements for iOS 8 and more devices. We improved the location manager, so it uses your location in a more desired way for the user (i.e. Minyan Now support or not). We made tons of bug fixes, content updates and many small usability improvements. This all supports the RustyBrick mobile account system, to back up your data and sync it between devices and platforms. Finally, we now enable you to share your favorite app with your friends via Facebook, Twitter, SMS, email or other networks you belong to - so go ahead and share it with your friends. While you are at it, leave us a review so others know how much you like the Siddur app. If you have feedback, problems or support requests, email us through the “Email Support” section of the app, so we can address your concerns. 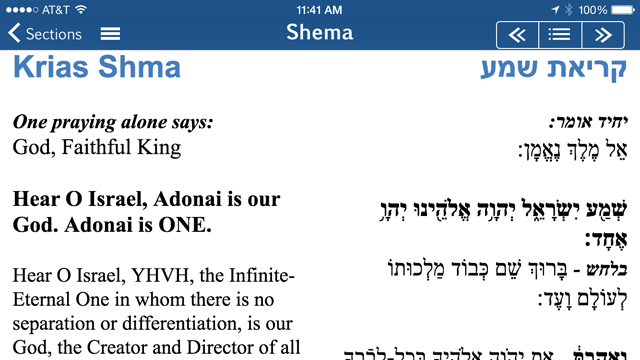 For more, check out the iPhone Siddur page.